This unique home is secluded but close to town. It is located in Clay County, West of Flora. It was built in 2003 and has 4 bedrooms, 3.5 baths, 2 gas fireplaces, 2.5 car attached garage and a finished basement. When you enter the home, an oak staircase leads up to the beautiful master suite. 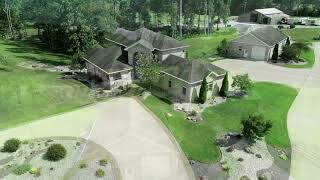 The property has 51 acres which includes part pasture and wooded acres. The private lane leads over a bridge to the outside entrance of the property. It is in the Flora school district. Directions from Flora: Go West on Old Route 50 about 4 miles. Turn right onto Cedar Elm Drive. Go about 1 mile to last house on the right (222 Hemlock Lane). It is at the end of a dead end road. There is a private driveway surrounded by fence and gate.